Last year, just before Thanksgiving, I wrote about the origins of "Black Friday" -- the legendary "busiest" shopping day of the year (which is not true; that happens on the Saturday before Christmas) on which retailers account books shift from red to black (another dubious claim). Up to 128 million shoppers and would-be shoppers could be expected this holiday weekend, but the numbers represent a drop of more than 5 percent from a year ago, according to a survey released Tuesday. Some 49 million U.S. shoppers already plan to hit stores this coming holiday weekend, prompted by pent-up demand and lured by deep discounts, according to the BIGresearch study for the National Retail Federation (NRF). An additional 79 million would-be shoppers are playing wait-and-see, planning to suss out the weekend promotions before deciding whether to shop, the survey found. But the 128 million people represent a drop of more than 5 percent from the 135 million people who said they would, or might shop a year ago during the Black Friday weekend, the kick-off to the holiday shopping season. Early-bird shopping on the Friday after Thanksgiving is an annual tradition for holiday bargain hunters across the country. This year Simon Property Group, Inc. ... is opening its malls extra early to help consumers get an even faster jump on their holiday gift lists. Most Simon malls will open their doors at 5:00 a.m. on Friday, November 28, the traditional start to the holiday shopping season, where consumers will be met with more retailer offers and savings and customer amenities, all under one roof. Even on-line retailers are getting into the act, getting a jump on "Cyber Monday" (the first workday following Black Friday, when cubicle-dwellers surf the shopping sites instead of doing the work that's expected of them). Browse our six rounds of great products, and vote for the ones you'd like to buy at an amazing discount. * Step 2: Check E-mail. Check your e-mail the day before each buying round to see if you've been randomly selected to participate in the race to buy. If selected, make sure you come back and log-in early on race day. We will have many more participants than deals, so the race is on. Good luck! Amazon has also set up a special page full of "Black Friday 2008 Deals," leading off with electronics , followed by gifts for sporty and outdoorsy types , winter apparel , home improvement bargains , and books and DVDS , among other items. The tantalizing angel on the cover of this card gives great reason to celebrate. Each of the ten cards contained in this set feature the photo shown. Here's the copy inside and outside the card: Outside: Celebrate Inside: A healthy & happy holiday season. It's simple, but it hit us right on the funny bone. Your friends are likely to get a big kick, as well. Each of the ten cards contained in the set feature this photo of a man shouting. Here's the copy inside and outside the card: Outside: Merry Christmas! Inside: Homo! Only one thing can be inferred from this card...Santa must be a homophobe. It's a shame, because he might fit nicely in the older bear community. Send this card to your friends and give them a holiday chuckle. Each of the ten cards in this set features the photo shown. Here's the copy inside and outside the card: Outside: A Barbie for Ben and a tool belt for Jane! Inside: I quit! Add some naughty, taboo fun to your favorite card games. 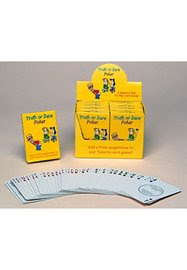 The Truth or Dare Poker Card Game contains the standard 52 cards found in any deck along with probing truth questions and hilarious dares on each card. Win a game and you get to assign truths or dares to the other players of your choice. The better your poker hand, the more people you get to challenge. Truth example: What are you most ashamed to admit you own? Dare example: Perform a puppet show with dirty sweat socks. This official poker deck features 52 different hot, buff men from Playgirl for your own personal playing enjoyment. Just don't let these studs distract you from your poker strategy and try not to drool all over the cards either...other players have to use them too. TLA is proud to offer this gorgeous, eye-catching gift set containing a trio of intoxicating pear-scented bath and body products from duross & langel. Fairly dripping with sweet and yummy yellow pear set within a white shea butter soap base and blended with pear nectar. Included in this set are shower gel, body cream, and soap. TLA is proud to offer this gorgeous, eye-catching gift set containing a trio of intoxicating peppermint-scented bath and body products from duross & langel. Soothe your senses and calm your soul with a unique and invigorating blend of peppermint oils. This set also includes soap, shower gel, and body cream. "Long, long ago, the North Pole was ruled by the good fairy Lady Boreal and her enemy was the wicked wizard Winterbolt. To protect Santa Claus from Winterbolt's foggy fury, Lady Boreal grants Rudolph the Reindeer a magical, glowing nose. Years later, Rudolph and his friend Frosty the Snowman are called on to save a needy circus at a special 4th of July benefit. But their big-top act turns to big-time trouble when Winterbolt appears - with a plan to steal Frosty's magic hat and extinguish Rudolph's legendary nose!" The cast includes Ethel Merman, Mickey Rooney, Red Buttons, and Shelley Winters. Yes, really. 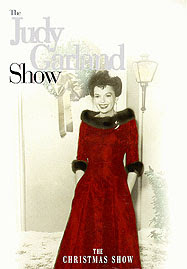 If you prefer something with lasting quality rather than something that requires an airsickness bag while watching, then this Judy Garland Christmas special is for you. As long as you can overlook Judy's barely hidden state of intoxication, you will be delighted by this episode of her early-60s TV series. Judy is joined by daughter Liza Minnelli and friend Jack Jones and Mel Torme. 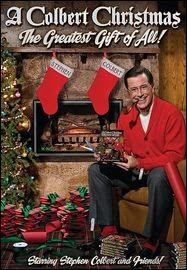 Now, if 45-year-old classics are not your preference, then you can't miss with tomorrow's nostalgia: Stephen Colbert premiered his Christmas special just a few days ago, and the DVD is already available for purchase. 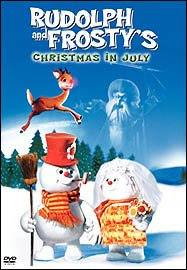 (How long did we have to wait for Rudolph and Frosty?) Includes unforgettable musical sequences in which Stephen sings with Toby Keith, Willie Nelson, Feist, Elvis Costello, John Legend, and Jon Stewart. Seventy years after its premiere in theaters, The Wizard of Oz™ remains one of the most beloved movie classics of all time. 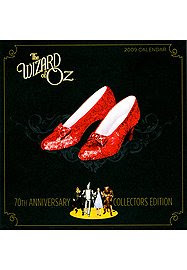 This calendar celebrates the seventieth anniversary of Dorothy's journey Over the Rainbow. It features a high-process cover with glittery Ruby Slippers, foil type and borders, and spot UV accents. The monthly spreads also boast spot UV as well metallic inks and vivid photos befitting the time-honored film. 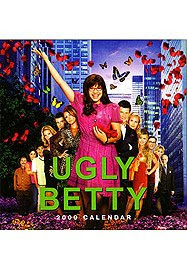 Ugly Betty boasts nearly 15 million viewers per episode and has won countless awards. The show also earned eleven Emmy nominations, the most for any comedy series on any network. This calendar brings together the unique humor, original style, and edgy look of this hit show by featuring photographs of the all-star cast accompanied by images and dialogue from the show. Says TLA Video: "Consistently garnering nearly 19 million viewers per episode, Desperate Housewives is one of our favorite guilty pleasures (especially now that the hunky gay neighbors have moved in)! The women of Wisteria Lane are back for another smokin' hot year of gorgeous photos and bitchy dialogue." And, for those who saw Heidi Klum on Jay Leno's show on Thanksgiving Eve ... while I could not track down the "Hollywood Fireman" calendar that the supermodel displayed, I was able to find the Sunset Strip Firemen 2009 Calendar , which should be a satisfactory substitute. Finally, I should note that TLA Video is having a marathon sale this weekend, beginning on Thanksgiving Day and ending at 11:59 p.m. on December 2. Look for "Gift Ideas for Film Snobs" and "Perfect Gifts," among other categories. If you haven't crossed off every name from your Xmas shopping list by now, you're just not trying! General Registrar Sheri Iachetta led the crowd at Central Place -- which included many local children, as well as their parents -- in the singing of Christmas songs (Meredith Willson's "It's Beginning to Look a Lot Like Christmas," Irving Berlin's "White Christmas," and Johnny Marks' "Rudolph, the Red-Nosed Reindeer," among others) while NBC29's Annie Scholz and Channel 19's Bo Sykes shared the emcee's microphone. 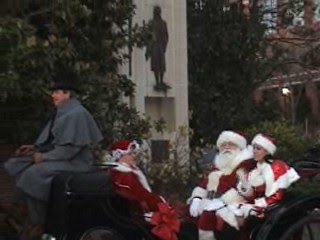 In addition to Santa’s welcome, three local students, one from the City, one from the County, and one from the local private schools will be honored with this season’s Holiday Spirit Award. Mylaya Simpson - Mylaya Simpson is a sixth grader at Walker Upper Elementary School. She is active in service and leadership activities. Mylaya's attitude is always positive and she has a unique way of having others look to her as an example. She brings those around her up, as well. Mylaya is serious about her academics, goal-oriented and determined to have a bright future for herself and those around her. Eric Hahn - Eric Hahn is an outgoing 8th grade student at Henley Middle School [who] is highly involved in his school and in the community. He is president of the Student Council Association and his leadership and enthusiasm is contagious! Whether he is volunteering on a Saturday morning for a civic organization or a school fundraiser, he does it with purpose and commitment. Cephra Stuart - Cephra Stuart is an 11th grade student from Shipman, Virginia. Her boundless good nature and deep sense of compassion embody the spirit of joy and generosity that define the holiday season. Cephra is an outstanding student and a model citizen at St. Anne's Belfield School. NBC29 has a story about one of the award winners here. WCAV-TV has a story about the Ferguson family, who donated the Christmas tree, here. On November 22, 1963, I was only four years old and living with my family in Appleton, Wisconsin (the hometown of Joseph McCarthy). We only lived in Appleton for about 14 months, and -- being so young -- my memories are generally dim. I do have some vivid recollections of the days following the assassination of President John F. Kennedy, however. Not, as those older than me would have, of remembering where I was when I first heard the news. I am sure I saw Walter Cronkite's news bulletin just after noon, however, because he broke into a broadcast of As the World Turns on CBS-TV, and that was a show my mother always watched. So unless I was taking a nap at the time, I was in the room where the television was playing. Here is a compilation of news bulletins from CBS, the ones that I must have seen or heard live. 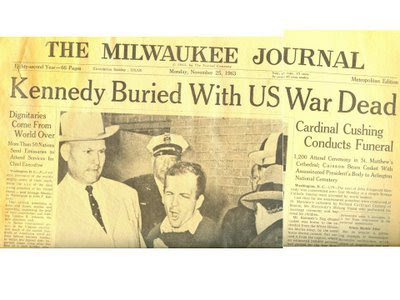 My most vivid memory of that weekend is of the killing of Lee Harvey Oswald by Jack Ruby. That happened on Sunday. We had just had breakfast and may have been preparing to go to church. Suddenly my mother, who was watching TV, screamed. She (along with millions of others) witnessed the shooting and reacted in a way that roused me from my toys. 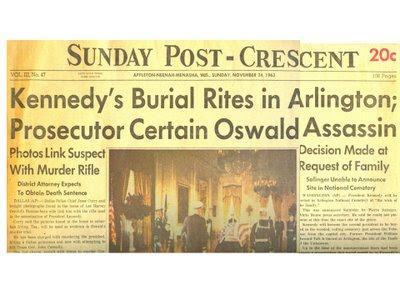 I suspect many bloggers will be sharing their memories of November 22, 1963, today. (Here's one from a Milwaukee native just a couple of years older than me.) If other bloggers want to share links to their own memories, feel free to post them in the comments section. Brian Riedl of the Heritage Foundation had a terrific article in Friday's Wall Street Journal that explains why "stimulus programs" generated by Congress are ultimately futile exercises. Government stimulus bills are based on the idea that feeding new money into the economy will increase demand, and thus production. But where does government get this money? Congress doesn't have its own stash. Every dollar it injects into the economy must first be taxed or borrowed out of the economy. No new spending power is created. It's merely redistributed from one group of people to another. Of course, advocates of stimulus respond that redistributing money from "savers" to "spenders" will lead to additional spending. That assumes that savers store spare cash in their mattresses, thereby removing it from the economy. In reality, nearly all Americans either invest their savings (where it finances business investment) or deposit it in banks (which quickly lend it to others to spend). The money gets spent whether it is initially consumed or saved. Governments don't create new purchasing power out of thin air. If Congress funds new spending with taxes, it is redistributing existing income. If the money is borrowed from American investors, those investors will have that much less to invest or to spend in the private economy. If the money is borrowed from foreigners, the balance of payments must still balance. That means reducing net exports through exchange-rate adjustments, thereby leaving net spending on the economy unchanged. Yet Congress will soon borrow $300 billion from one group of people and then give it to another group of people and tell us we're all wealthier for it. I'm sure if the lame-duck Congress passes a "stimulus" law, many Americans will be grateful for the "windfall" of a three-figure check just in time to pay for their post-Christmas credit-card bills. But they won't be any richer for it, now or ever. 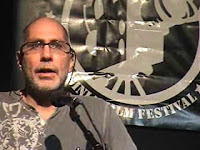 Mexican novelist, screenwriter, and film director Guillermo Arriaga was a special guest at the 2008 Virginia Film Festival. Babel , for which Arriaga wrote the screenplay, was shown on the afternoon of October 31. I had not seen it previously, and almost walked out. It is truly an awful film, although it has a few intriguing sequences. Any one of the overlapping plots might have made an interesting movie by itself -- except for the story of the deaf, nymphomaniac, Japanese high-school coed --but this is one example of the whole being less than the sum of its parts. There were two Arriaga films I was unable to see: He presented his 2000 film, Amores Perros, on Saturday afternoon, and his newest film, The Burning Plain, which stars Charlize Theron, on Saturday evening. On Sunday afternoon, however, I caught Arriaga's 2005 collaboration with Tommy Lee Jones (who directed and starred), The Three Burials of Melquiades Estrada, which was well worth seeing. From production design to character development, every element of this film is on target. 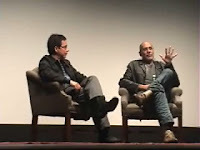 The collaboration with Jones brought out the best of Arriaga (who also appears as a cowboy in one scene in the film), who -- as his post-screening conversation with the University of Virginia's Hector Amaya demonstrated -- is a thoughtful, personable, and good-humored interlocutor. Is This Ironic? Or Isn't It? Isn't sports supposed to make you more healthy? Well, yes. Playing sports is a healthy activity. Watching sports? Not so much. Listen up sports fans: Being passionate about sports -- watching it, that is -- can be detrimental to your health. That's the word from a sports medicine research team who conducted a study linking sports fanaticism with poorer health habits. University of Arkansas, Little Rock, researchers surveyed 515 people and divided the participants into two groups: those who strongly identified with sports and those who did not. They found the avid sports fans tend to eat more fast food, skip breakfast more and ate more fatty foods and fewer vegetables than people who are disinterested in sports. The sports fans had a higher body mass index than others. And, noted lead author Daniel Sweeney, "The study results also revealed that the more psychologically connected fans are to a team, the more likely they are to consume more alcoholic beverages on the days that they choose to drink than do less excited sports fans." I'd guess that even darts played at a tavern is more beneficial, health-wise, than watching the NBA playoffs at home. Just in time for the Conservative party convention in Winnipeg, a new non-partisan organization called Gay Dominion has been launched to represent gay and lesbian conservatives. Yes, they do exist. In fact, Western Standard readers have already come to know blogger Chris Reid, the Conservative candidate in Toronto who was forced to resign for being too conservative. Reid is also gay. We have two main missions. First, we want to end the isolation that many gay conservatives feel within their own community. Most of the gay media (newspapers, bloggers, websites, magazines, etc) are avowedly left-wing and do not allow for a diversity of political views. Gay Dominion would like to provide an alternative point of view on many issues that affect the gay community. Secondly, we want the conservative community to understand that there are many gays amongst them, and that they need to welcome gays into their midst. We also want to work within the Conservative Party of Canada to ensure that gays are not left behind. This non-partisan mission suggests that Gay Dominion hopes to play a role more similar to the Independent Gay Forum than any of the political activist groups I mentioned in the first paragraph, but it may have affinities in both directions. There is something charmingly retro about the name "Gay Dominion," since Canada has not generally called itself a dominion since the 1950s, and in fact changed the name of its national holiday in 1982 from "Dominion Day" to "Canada Day." The past couple of weeks have been unusually busy for me, so it has taken some time to edit the video recordings I made of several of the introductions and post-screening discussions that took place at the Virginia Film Festival during the last two days of October and the first two days of November. I previously posted video clips of the arrival of celebrities at the opening of the festival (and thanks to the Movie Monday Blog Carnival for linking to that post at Observations from Missy's Window) and the panel discussion on Lake City (which opens this weekend) with co-stars Sissy Spacek and Troy Garity and co-directors Perry Moore and Hunter Hill. After the big opening of Lake City on Thursday evening, filmgoers dispersed -- some to the gala party, some to additional screenings. The film was introduced by Justin Humphreys , who is writing a biography of producer George Pal. On Friday morning, I saw John Sturges' 1955 film, Bad Day at Black Rock , starring Spencer Tracy, Robert Ryan, and a cast of some of Hollywood's best character actors (Oscar-winners Ernest Borgnine and Walter Brennan, to name two). The screening was followed by a panel discussion featuring the director's son, Michael Sturges, and led by Sean McCord. There were about 200 high school students in the audience, who were seeing the film as part of their studies. (My video from that event is still being processed, and I will add it here later.) Following Bad Day at Black Rock, I was able to see -- for the first time on a big screen -- the Robert Wise/Jerome Robbins 1961 film version of Leonard Bernstein and Steven Sondheim's West Side Story . 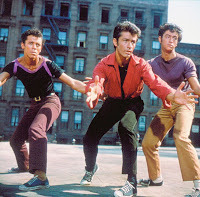 In the discussion that followed, it was noted that librettist Arthur Laurents is directing a new stage production of West Side Story, which will, in fact, have a pre-Broadway tryout at Washington's National Theatre in December, just as the original production did back in 1957. (Not a bad project for a nonagenarian.) Having seen West Side Story on stage many times, including one particularly memorable West End revival, and on television once or twice, the wide-screen (Super Panavision 70), full Technicolor version was quite an experience. Some things don't hold up well -- the fake slang terms, for instance, are even less believable on screen than they are on stage -- but the overall production still looks like something that deserved the many awards it received. The discussion was led by Rich Collins of the University of Virginia and Ted McKosky of Radford University. That night there was an unusual panel discussion featuring director Rodrigo Garcia via Skype (he was in Los Angeles) and producer Julie Lynn, with co-star David Morse, discussing the new film, Passengers. (I am still processing this video, as well. Look for it later.) The last screening I attended on October 31 was Galaxy Quest, the 1999 parody of sci-fi television starring Tim Allen, Sigourney Weaver, Alan Rickman, and Justin Long (among others: look for a pre-Office Rainn Wilson in a small supporting role as a space alien). 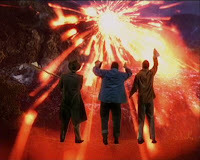 Galaxy Quest was introduced by producer Mark Johnson, who went on to produce The Chronicles of Narnia series and who is a member of the Virginia Film Festival's board of advisors. Looking for Volunteer Opportunities Abroad? Britain is facing a sperm donor shortage after reversing confidentiality laws and limiting the number of women who can use sperm from one donor, fertility experts warned Wednesday. Britain in 2005 changed the law protecting anonymous sperm donors and allowed children to learn the identity of donor fathers - one reason, fertility experts say, there are fewer donors now. "The only countries that seem to have enough sperm are those that pay - like the U.S. and Spain - or the countries that retain anonymity," said Allan Pacey, a member of the British Fertility Society that warned of the shortage in the British Medical Journal. "In the countries that have removed anonymity ... there seems to be a problem," he said. In 1991, Britain logged 503 sperm donors, according to figures from the Human Fertilisation and Embryology Authority. In 2000, there were 325, and in 2006 - the year after the law was changed - the number dropped to 307. Experts say 500 donors a year are needed to cope with the number of couples needing donor insemination in Britain. Check with a nearby British consulate to explore how best you can help fix this dire situation. The folks at ReasonTV have hit another home run with this video about smoking bans -- including an ordinance in Belmont, California, that prohibits people from smoking in their own homes. The arrogance of nanny-statists knows no bounds. Will somebody please tell the 130-plus-million people who voted last Tuesday that local elections, not presidential elections, are far more important in terms of affecting our daily lives? As the nation enters the Obama-Pelosi-Reid years, a small group of political activists has its eyes on the next presidential election cycle. Since the campaign for 2012 begins today, I am interested in your views on will win the Republican presidential nomination four years from now. This little poll is obviously not scientific (those types of polls won't be published for at least several days), but it will give a snapshot of the views of readers of this blog (and others who may find it on other web sites) about what to expect in 2012. Perhaps the most surprising result from Charlottesville's precinct reports this year is that there were no write-in votes for Waldo Jaquith. Is the ur-blogger losing his touch with the hometown electorate? This lacuna may be no accident. The overall write-in totals were small, indicating that voters took this election very seriously with regard to all three races on the ballot. There were 71 write-ins for President, including 26 for Ron Paul, 12 for Hillary Clinton, and one for certified write-in candidate Brian Moore. Others receiving write-in votes for President included Joe Schriner (3 votes), Michael Bloomberg, Henry Clay, Frank D. Roosevelt, Marcy Kaptur, Colin Powell, Mitt Romney, Bill Richardson, Leslie Dishannon, Kerry Dooley, John L'Etoile, R. D. Patrick Mahoney, Scott Elmer Moeller, John Paul, Joe Schneider, Optimus Prime, and McCain But Never Palin. The candidates who had ballot status received these votes in Charlottesville (all unofficial totals): Barack Obama (15,537); John McCain (4,057); Chuck Baldwin (26); Bob Barr (86); Cynthia McKinney (17); and Ralph Nader (61). In the U.S. Senate race, which was won by former Governor Mark Warner, someone cast a write-in vote for "MARKWARNER" (one word, all caps). Warner edged out his chief rival, former Governor Jim Gilmore, by 16,313 to 2,907. Glenda Gail Parker received 105 votes, and Libertarian Bill Redpath got 143. Other write-ins in the Senate race in Charlottesville were John Galt (who is John Galt? 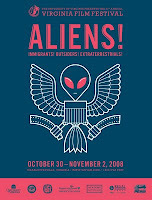 ), Congressman Ron Paul, Delegate Bob Marshall, Krishna Kishore, Barack Obama, Larry Joseph Sabato, David Bartok, Ryan Coughlin, Sahara Ghafari, Duncan Baker II, Al Lopez Jr., Diane Garrett Moeller, Matt Toner, Sean Shanks (3 votes), Prolife, Mary Smith, Greg Moritz, Michael Francis Moore, Geri Wilkins, and the initials "JP" and "W." There were 31 write-in votes in this race. There were 39 write-in votes for this race in Charlottesville, with John Galt making a return appearance, as well as musicians Jerry Garcia, Andre Young AKA Dr. Dre, and Soulja Boy. Two-time congressional candidate Al Weed received two votes. Others receiving write-in votes were UVA President John Casteen, former UVA basketball coach Pete Gillen, and 2007 Libertarian state senate candidate Arin Sime. Odd votes in this race included Amethyst Initiative, which refers either to a drag queen performing at Club 216 or the group of college presidents seeking a national debate about the drinking age, and the author of Das Kapital, Karl Marx, as well as perennial write-in candidate Mickey Mouse. Additional names on the write-in list were Rear Admiral James J. Casey USN (ret), Antoinette Garza, John Devor, Brian Bristow, Tim Lewis, John Norton Moore, Oliver Kuttner, Brice McKeever, Geoffrey MacDonald, Erich Forrest Moeller, Elizabeth Boyd, Fred Schneider, and Eddie Smith. Someone named William Wilder was written in for all three offices (president, senator, and congressman). Another voter took the time to write in "none of the above" in all three races. (The handwriting matched each time.) Several blank write-in votes were recorded, as well as variations like "none" and "none of them." Although not all the figures have been analyzed, it appears that Charlottesville voters chose at a ratio of better than 3 to 1 to use the eSlate electronic voting device instead of the paper ballot fed through the eScan digital scanner. Even when lines for the eSlate were much longer and voting a paper ballot would have speeded the process for them, voters chose to cast their ballot on the DRE. I plan to write about this live Election Day experiment, which has been fascinating from the moment we decided to purchase the Hart Intercivic eScan equipment to supplement our eSlates, which we have used in Charlottesville in every election since May 2002. Recreation Precinct eSlate voting machines await voters minutes before the polls opened at 6:00 a.m. The first wave of voters arrives at Jefferson Park Precinct at 6:00 a.m.